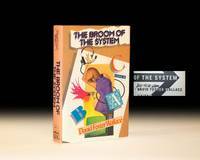 The Broom of the System by Wallace, David Foster - 1987. Back Bay Books. PAPERBACK. 0316925284 Item in good condition. Textbooks may not include supplemental items i.e. CDs, access codes etc... . Good. Riverhead Books. PAPERBACK. 1594482675 Item in good condition. Textbooks may not include supplemental items i.e. CDs, access codes etc... . Good. Riverhead Books. PAPERBACK. 1594482675 Item in very good condition! Textbooks may not include supplemental items i.e. CDs, access codes etc... . Very Good. 2007. Back Bay Books. PAPERBACK. 0316925195 Item in acceptable condition including possible liquid damage. As well, answers may be filled in. Lastly, may be missing components, e.g. missing DVDs, CDs, Access Code, etc. . Fair. W. W. Norton & Company. PAPERBACK. 0393326292 Item in good condition. Textbooks may not include supplemental items i.e. CDs, access codes etc... . Good. Riverhead Books. Used - Good. All orders guaranteed and ship within 24 hours. Your purchase supports More Than Words, a nonprofit job training program for youth, empowering youth to take charge of their lives by taking charge of a business. Bookseller: More Than Words Inc.